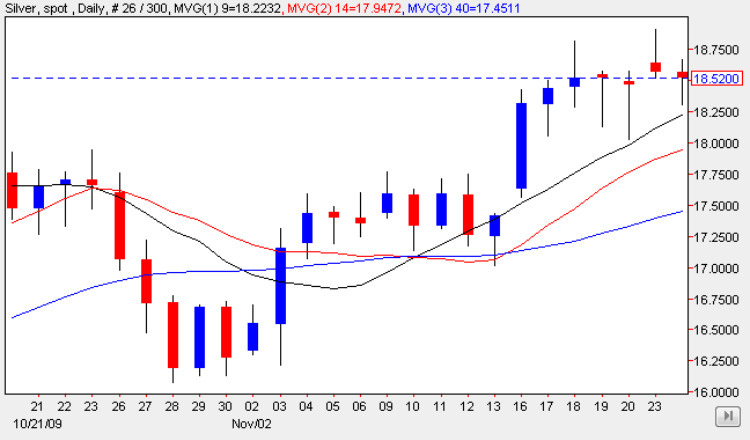 Whilst the gold spot price continues to surge ever higher, spot price silver on the other hand continues to struggle at this level, with another day of weakness and indecision as the silver trading session ended with a minor hanging man candle, or a small doji cross whichever you prefer. Interestingly however, the 9 day moving average once again provided a platform for the low of the day which found some support from this technical indicator, and which would seem to suggest that despite the ‘bearish’ sentiment of the last few days we could actually see spot silver prices break higher in due course. However, the pull through effect from gold has definitely evaporated, with the ‘traditional’ correlation between the two commodities now a thing of the past. For the time being we have to trade on the technical picture for spot silver in isolation, and whilst the last few days have certainly had a bearish flavour, with the support now being provided from the moving averages, this could indicate that the market is now ready to move higher once again, and should we see a break and hold above the $19 per ounce level, then this will provide the break above the upper level of the current price congestion, and create the platform for a further move up in due course.